Responsibility as a leader is the ability to respond quickly to a complex and changing business environment. It means using values to make decisions that not only affect brand trust and corporate reputation, but impact upon employees and the wider community. In today's increasingly interconnected world, it is more important than ever that managers can achieve goals and desired results while still maintaining a degree of authenticity, ethics and stewardship. The Responsible Leader identifies what it means to be an authentic leader, taking in intra-organizational relationships, role modelling and ethical practice. Addressing the practical challenge of implementing a framework of corporate social responsibility in an organization that may embrace thousands of people, The Responsible Leader sets out what this strategy looks like in practice and advises on creating a new and hopeful narrative for the future. Drawing on in-depth case studies from HSBC, PwC, Oasis and Marks and Spencers that chart the journey to responsible and sustainable management in challenging environments, it presents a fresh vision for leadership success that goes beyond simple compliance. Tim Richardson is Director of leadership development consulting firms Waverly Learning Ltd. and It's Original Ltd. His clients include HSBC, BBC, Lloyds TSB, Barclays and Unilever. He was previously the Head of Leadership Development and Talent Management at PwC, where he created the firm's Emerging Leaders Program and developed a global talent management strategy. 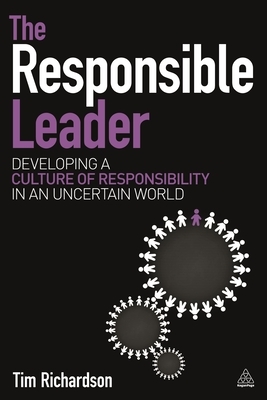 The Responsible Leader includes a foreword from Professor Charles Handy, previously of the London Business School, author of the bestselling The Age of Unreason (Harvard Business Review Press) and named among the Thinkers 50, a private list of the most influential living management thinkers, just behind Peter Drucker.